This four-volume Companion to Shakespeare's Works, compiled as a single entity, offers a uniquely comprehensive snapshot of current Shakespeare criticism. Complementing David Scott Kastan's A Companion to Shakespeare (1999), which focused on Shakespeare as an author in his historical context, these volumes examine each of his plays and major poems using all the resources of contemporary criticism from performance studies to feminist, historicist, and textual analyses. Scholars from all over the world - Australia, Canada, France, New Zealand, the United Kingdom and United States - have joined in the writing of new essays addressing virtually the whole of Shakespeare's canon from a rich variety of critical perspectives. A mixture of younger and more established scholars, their work reflects some of the most interesting research currently being conducted in Shakespeare studies. Arguing for the persistence and utility of genre as a rubric for teaching and writing about Shakespeare's works, the editors have organized the four volumes in relation to generic categories: namely, the tragedies, the histories, the comedies, and the poems, problem comedies and late plays. Each volume thus contains individual essays on all texts in the relevant category as well as more general essays looking at critical issues and approaches more widely relevant to the genre. This ambitious project offers a provocative roadmap to Shakespeare studies at the dawning of the twentieth-first century. 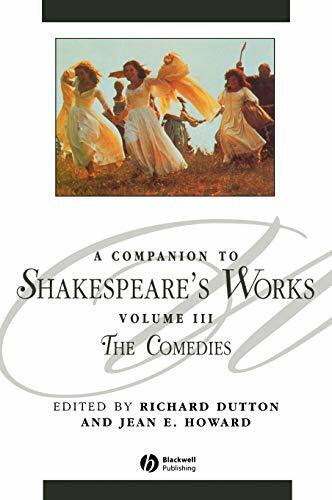 This companion to Shakespeare's comedies contains original essays on every comedy from The Two Gentlemen of Verona to Twelfth Night. In addition, the volume features twelve articles on such topics as the humoral body in Shakespearean comedy, Shakespeare's comedies on film, Shakespeare's relation to other comic writers of his time, Shakespeare's cross dressing comedies, and the geographies of Shakespearean comedy. Richard Dutton is Professor of English at Lancaster University, author of Mastering the Revels: the Regulation and Censorship of Renaissance Drama (1991) and Licensing, Censorship and Authorship in Early Modern England: Buggeswords (2000). He is editor of the Macmillan Literary Lives series. Jean Howard is Professor of English at the University of Pennsylvania and former President of the Shakespeare Association of America. She is also one of the editors of The Norton Shakespeare, and author of The Stage and Social Struggle in Early Modern England (1994).